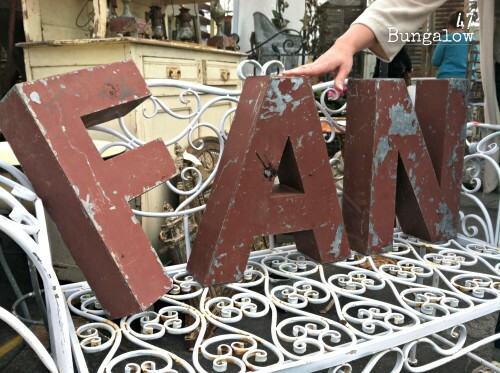 When it comes to decorating with salvage letters, I’m a FAN! I love everything about them. I love the different sizes and colors, the rust, peeling paint and the variety… so much variety. 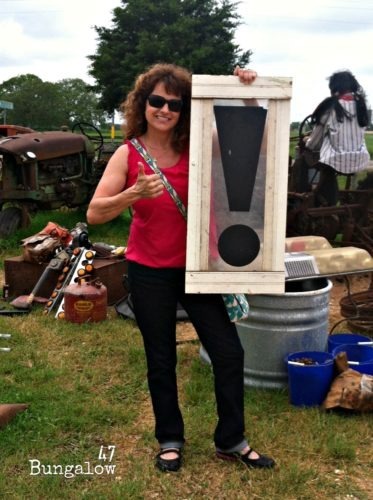 While we were shopping Antiques Week last spring, my obsession got the better of me and I ended up bringing home a truck load of salvage letters. LITERALLY! Yup, that’s my truck! Bet you thought I was joking. I would never joke about something as serious as my love for salvage. 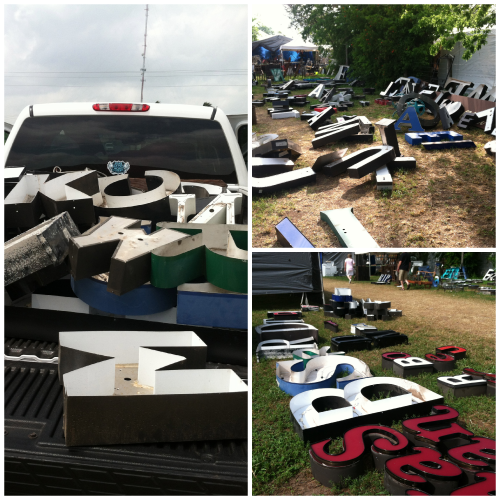 When we came across this huge supply of letters we loaded up and left no letter behind. Well, at least we tried. The letters we couldn’t bring home we staged for FUN photo shoots. If I can’t have them all then at least I’ll have some great pics. 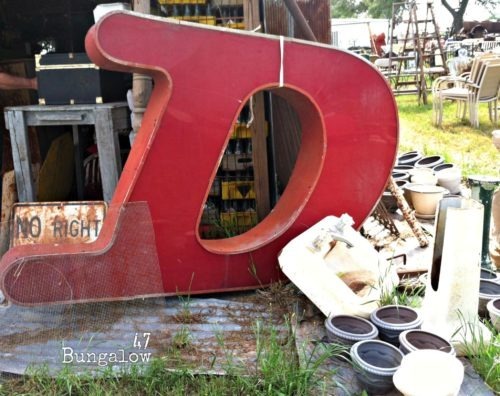 Standing around 5 feet tall, this fabulous letter D sadly was another one that was left behind. But if I could have figured out a spot for it in my home you can bet I would have found a way to get it there. The majority of the letters we did bring back were for the store. 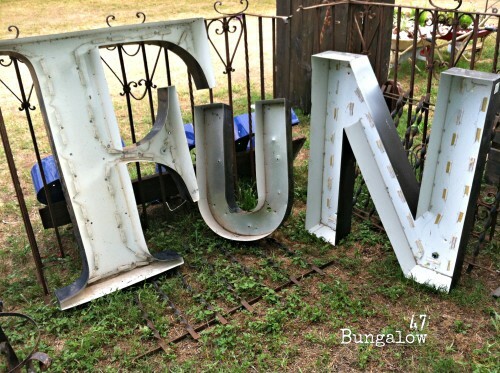 Mixed in were the letters for this giant Studio 47 sign. 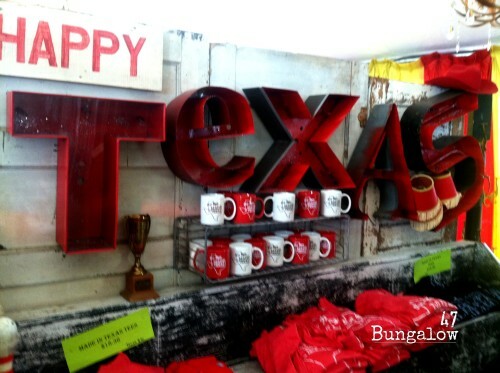 We hung them in our back room at Bungalow 47. Studio 47 is where the magic (or should I say hoarding) happens. We are so blessed to have such a wonderful space to play and create. More letters mixed in with the stash. So many fonts, so little time. The twins really got into the spirit of salvage letter shopping and decided to find the letters to spell each of their names to bring home as their ‘Texas treasure’. 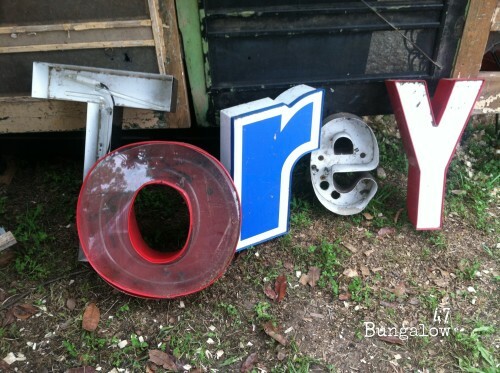 We found all the letters for Torey’s name at the Junk Gypsy tent near Zapp Hall. 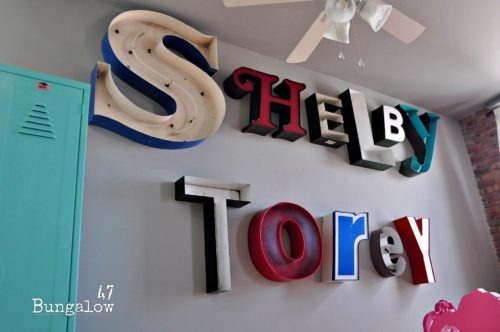 Shelby’s name came from a collection of letters from another vendor in the same area. 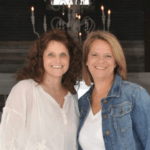 Their names look positively adorable hanging on their apartment wall. This explanation point was my ‘Texas treasure’. I’m totally guilty of using way too many of these when I type, but if using too many explanation points is wrong than I don’t wanna be right!!!!!!!! Argh! Those are fabulous!! I guess I need to drive out and see what you’ve got. I love ’em too! 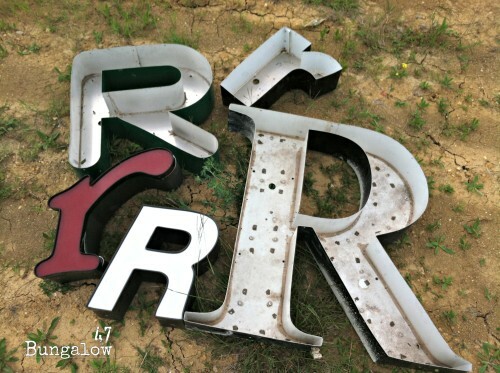 I got a bunch of big metal black letters at an auction, but I would love to have so many fonts and colors. Great score!